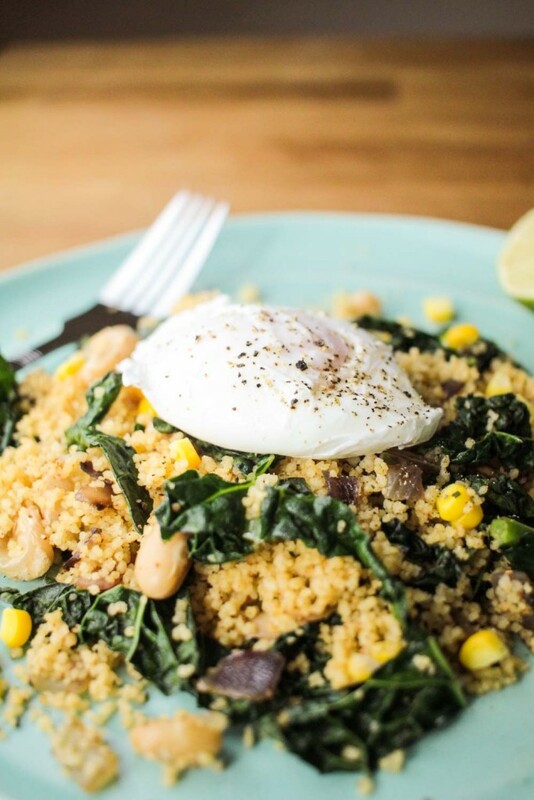 This couscous salad is great for a lunch – it’s fresh, full of flavour and packed with healthy ingredients, plus the runny egg just goes beautifully with it. Working from home now is great as when it comes to lunchtime I don’t just have to have a sandwich. I think it’s important to have variety in your life when it comes to food, otherwise you just get bored of having the same thing. As you know I have joined the gym and it’s going rather well, there’s been a couple of weeks where we haven’t been but on the whole it’s going better than I thought. I do come back starving though so lots of things don’t tend to satisfy me. We were coming back from the gym the other day and I said to Dean on the way home what did he fancy to eat? He said he wanted scrambled egg which to be honest I didn’t. 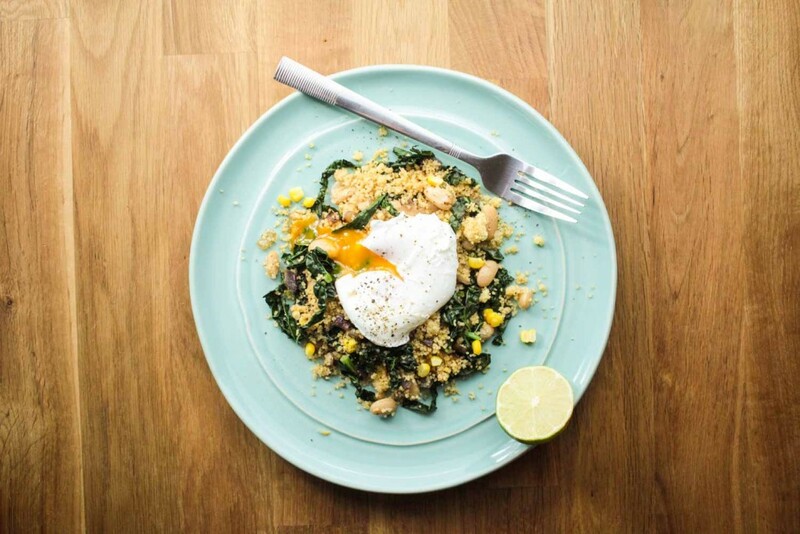 I fancied a runny egg, we had some kale in the fridge which we hadn’t used and were not planing on using it as we were out the next few nights. I hate waste and it’s such a shame to through things away. So I came up with this recipe, I did say to Dean he didn’t have to have it but he said it sounded yummy so wanted to try it. I am pretty useless at poaching eggs whereas Dean’s are always perfect so was his job. His tip is to use a ladle to lower the eggs into the water and then give it a swirl to keep the egg white together. When checking they are ready he lifts the egg out of the water and gives it a little wiggle. If the egg doesn’t look snotty but still has a good wiggle to it, it’s ready! In the recipe I have put the coconut oil as optional but I would really recommend that you buy some, not just for this recipe but you will definitely use it and come to love it, plus it’s much healthier for you than other oils. It gives a lovely flavour to your food without being overpowering. You can use it for eggs, vegetable stir fries. It even says on the jar that you can use it in your hair and on your body!  I’ve not tried that myself yet! We have poached eggs a lot normally for breakfast on toast and I always prefer them to fried. We sometimes have them in our ramen also. What do you have poached eggs with? I’d love to hear your ideas in the comments. Boil your corn on the cob to the instructions on the packet. while your couscous is on the hob, in a frying pan melt the coconut oil and on a medium heat cook the onions and garlic until soft. Add the kale and stir fry for about 5-8 minutes. Add your eggs to a pan of boiling water and poach them for 3/4 minutes. 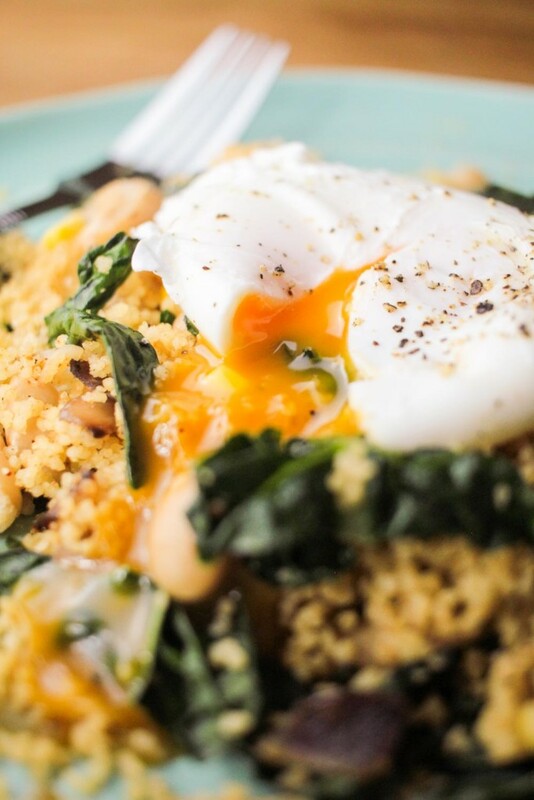 While your eggs are poaching add your calleine beans to your onions and kale mixture and stir in for 3-4 minutes. When your eggs are done gently take them out of the water. And set a side on a plate. Add the couscous mixture to the kale,onion and beans and stir it all in and eat through for about one minute. Cut the sweet corn off the hob and sprinkle in. 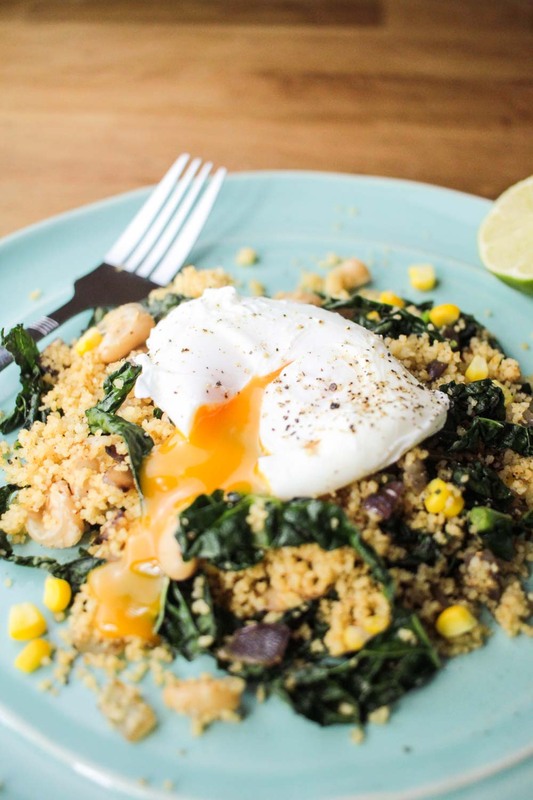 Put the couscous on to a plate and place the poach egg on top. I have recently started poaching eggs and I love it. I put it on anything from salad to chickpea curry. 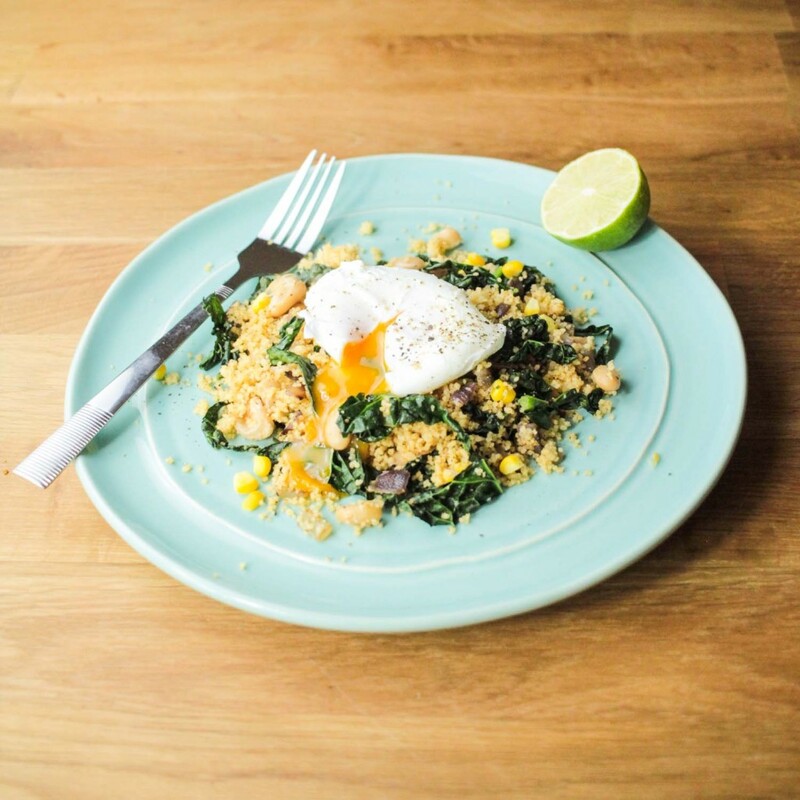 Love the idea of using kale with couscous. Thank you Suchi. There is nothing better than a poached egg. I love kale and its so good for you! YES! This is definitely my favorite type of salad! 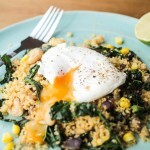 I’m a total couscous lover and would die to have a bowl or two… Great recipe! Thanks for sharing! 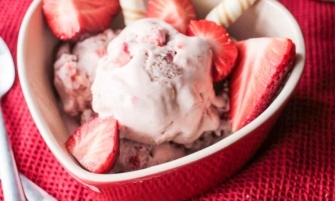 This dish looks absolutely delicious! 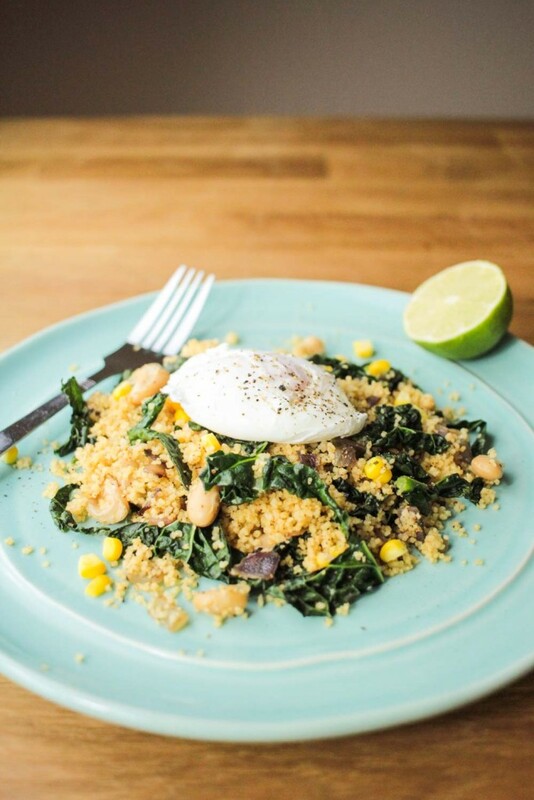 I love everything about it…literally…the gorgeous poached egg, cannellini beans, kale, couscous and corn. This dish is definitely going in the dinner rotation! YUM! Thank you for your kind words Holly! I hope you enjoy it as much as I did. Poached eggs are just glorious! This is a beaty for sure. Breakfast, lunch, or dinner right there!